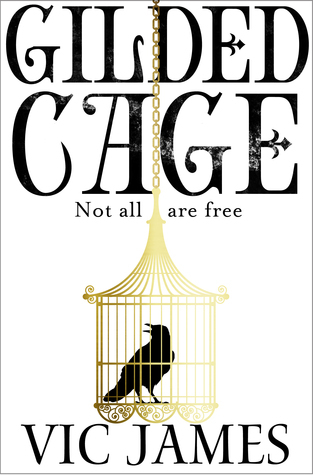 Gilded Cage by Vic James. Was that cowardly? Maybe. But it didn’t mean it wasn’t true. Trust was what made everything possible. Trust lent you someone else’s eyes, someone else’s strong arms, or quick brain. Made you bigger than just yourself. I was going to apologise for missing last week, but that would feel dishonest as the only thing I’d be sorry for would be that I didn’t have anything to share ... and that couldn’t be helped. Sometimes, a reading break is just as relaxing and let’s you return to your books with a new appreciation. Or at least I find that true for me. This first book in a proposed trilogy is every historical reader’s dream, provided they also like a touch of fantasy, a good dose of political intrigue, and quite a bit of social commentary. The characters are all (and there are quite a few) very nuanced and I’m not sure of all of their motives yet. As is often the case, I find myself drawn to one of the more obscure and mysterious characters and have little patience for some of the others, who seem deliberately straightforward, but who I suspect will also turn out to have more up their sleeve than is apparent. The setting is quite unique in an England reminiscent of the era past the industrial revolution, but within a class division and a master-slave-system still firmly in place. The worldbuilding is quite strong as it isn’t too unsettling to enter this in some cases familiar and in other aspects very alien environment. One of the most interesting aspects to me is that the ruling class is made up of those who would traditionally have been hunted down and executed for their powers, but here they are too strong and too feared. And how they treat those weaker than themselves is hauntingly familiar ... even if quite different in practice. I look forward to finding out how the plot will unfold further and I really hope for a more prominent role for a certain string pulling character. Do you take reading-breaks? If so, do you plan on taking them or do you decide spontaneously? Share your thoughts and teasers in the comments! This looks like an interesting book - I like the teasers you chose. I often take short reading breaks, if I just haven't got the focus to stick with a book because I'm tired or have too much going on in my life. This sounds good. I'm adding it to my wishlist. I don't really take reading breaks. I'm always reading something. The amount of time I read can vary though. Here are mine for the week. Happy reading! Sounds interesting, I like the teasers and the cover. Hope you enjoy it! Here's my teaser. I don't take reading breaks. I might switch genres to liven things up though. This sounds interesting. I liked the quotes. I've always got a book or an audio going. I like the teases.